Antiques challenge. Experts Christina Trevanion and Paul Laidlaw shop up a storm before heading to an auction in Market Harborough. 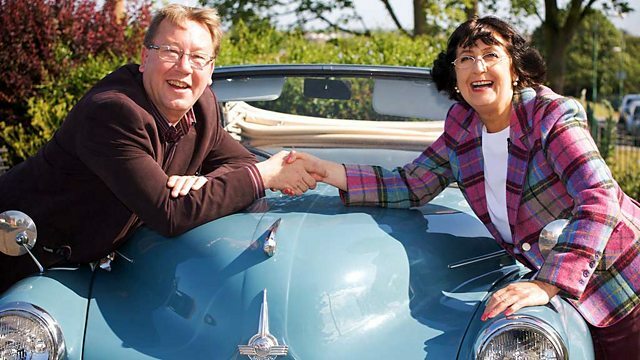 a classic car and a goal to scour Britain for antiques. I haven't actually worked with you before. And it makes me quite nervous. No, seriously, you have forgotten more than I will ever, ever, ever. -Whereas you are like the neuroscientist of antiques. and knows more than a couple of things about antiques. You don't want to get me started about Georgian wine glasses. whose charm is matched only by her optimism and determination. I could give it a new home. Would you like to pay me to give it a new home? Um, it is not the sort of thing I normally do. each, in a rather fetching 1951 Standard Phase 1 pick-up. -Is that the gear stick? -That's the column shaft. Look over your shoulder. Get in! All cars should have these. The thing is, you know what is really cool, if I do it really quickly, you can actually take off. journey culminates in Northwich, in Cheshire, over 600 miles later. and heading to their first auction in Market Harborough, Leicestershire. I don't mind telling you, I've no idea where I am. You're in Suffolk, actually. Ha! And our car seems to be doing funny things to Paul. -I've found my true self. I'm telling you, dungarees tomorrow. I think there's a gear problem. Oh, no, you haven't broken it already, Paul? I don't know about you, but I don't like the smell in here. It is really not smelling very healthy, is it? No, not a great start, this. -Oh, I think you broken it! Just as well we're not in the middle of nowhere. Oh, wait a minute. -Um. There is a footpath. -Can we head towards civilisation? -Don't worry, chaps, someone else will deal with the car. the first stop is the wool town of Clare. fair share of historic relics that might bode well for our antique hunters. -Here we go. I think we part company here, do we? -Yes, that's the antiques over there. -That looks like your shop over there. I better go find mine, hadn't I? -I shall wish you luck. her own adventure up and running at her first shop of the day. from over 100 dealers to peruse. stick to what you know, which is silver, jewellery, small things. But I feel like I want to go a bit wacky. Yeah, this should be interesting. Those look really sweet... Pickle forks. Scottish. Little pieces on top. were commonplace at Victorian dining tables. and handling your food became taboo. Do you ever use a pickle fork, David? I haven't used one in quite a while, actually, to be fair. -Normally they are longer than that, aren't they? -To get into the jar. They sink, don't they? -Like at the chip shop. Classy or not, the owner is looking for £22 for those pickle forks. -Is there any chance you might go for £15 on those? I don't think he will, but let me phone him for you. Paul is rummaging around the shelves of Market Hill Antiques. packed full of interesting curiosities and collectibles. -Nice scent bottle there for you, look. -Which one are we looking at? -You can have for 30 quid. That's a fantastic discount from the original ticket price of 125! You know there's profit in that. You know how to tempt a man, there's no two ways about it! Uh, lovely, late Victorian... Do you call them grenade perfumes? I do. -Yeah, cos that's what it is. No nasty surprises where... the neck's been chipped or cracked. My eyes, I'm easily distracted. I'm seeing lovely things hither and thither. None of us are in this to come second in this race. That little Holy Grail that we're all seeking. Well, if the Holy Grail is a pickle fork! Ha! -..but he's willing to do £17. -As I say, I still have him on the phone. and they're very, very sweet. Is there any chance you'd do 15 on them? It just gives me a fighting chance at auction, really, if possible. Oh, 15 would be better for me. Are you sure, Alan? That's really kind. picking up the pickle forks for £15. See if there's anything else. Meanwhile, Paul's clapped an eye on something rather unusual. And you have landed in trap. 1, 2, 9 or B. -Do you know what that means? You've got me with that. I hate a conundrum and, see, now I'm not going to sleep tonight. A bit stumped, eh, Paul? That doesn't happen often. -What's the price on that? -You can always...make me an offer. One is looking like it's out the window. But I need to keep my powder dry! Deary me! It seems BOTH our experts are having a very productive morning. Isn't that lovely? I really like that. It says brass, but that is definitely not brass. and that is a bit bashed, but that...is fab. I've got to carry this down four flights of stairs now, haven't I? who is still stalking the floor over at Market Hill Antiques. You could save yourself a lot of time and buy all five items here. -What price is on the wounded soldiers? -They can be about £25. hand-painted back at the factory. -You've got broken arms and bandaged heads, you see? These have literally been through the wars. £25, I am tempted. And he's noticed something else right up his street. Uh, you'd call it a Toby jug, I'd call it a character jug. Now, this is the smaller of the varieties. You say you had... The big one is the one everyone wants. -800 to 1,000 every time. Um... But we don't see so very many of them. Don't need to be an expert to identify the manufacturer of that. Absolutely fantas... I mean, I really like this. I like the medium, I like the origin, and the subject matter? Well, don't even get me started. Hey, it looks like you've got started all by yourself, huh! to take her offer of £40. -£50, do I like it £50? Is it going to make that at auction? Probably not, but I like it. -I think I'm happy with that, David. for the grand old sum of £65. But has her rival managed to sort out his own shopping-list conundrum? How many items have you clocked up now, Paul? One, two, three, four lots. I would be off my head to buy four lots here. and I take my chances, but it's got to be right. Yeah, three are known. You've got 'em! That's a bold start for Paul. with a little bit of catching up to do. to Bumpstead Antiques & Interiors, don't you love it? Maybe you could borrow their car, Christina. Owner Graham Hessell is showing Christina around. Beautiful, look at those guys. And that's rather lovely, isn't it? Wild Flowers pattern, 13668. So, what have we got here, Graham? -So, and collectors would want it as a set of six. But nonetheless, it's very pretty, isn't it? And people do collect Shelley, it is very collectable. and remains a popular Staffordshire china. -What have you got on that, on our label? That is pretty, I do like that. And from coffee service to something completely different. OK, so how much have you got on your record player, Graham? You can make me an offer on that. -I would be looking for something in the region of £35, £40 for it. But the problem is, it doesn't work. taking it down to the river on a nice, sunny day. -And then finding it doesn't work. I would probably be looking at maybe £10 or £15 to sell it on at auction. -Good, that's the main thing. You'll need to come up a little bit, I think. What about if we did £60 for the two? -What would you want for the two? 70. Will you meet me in the middle at 65? -Yeah, I appreciate that. Fine, OK, we'll do that. For a record player that doesn't work and an incomplete coffee service. both our experts have acquired quite a lot already. the hallowed streets of Cambridge. of one of the most extraordinary periods in British history. So, this is Pepys Library? -It certainly is and we're going to go upstairs and have a look at the library itself. Born in London in 1633, Samuel Pepys was the son of a tailor. now sits with pride of place in his former college. was his desire to record the events around him. a tumultuous decade in British history. -This is one of the six volumes of the diary. -you carried on until you'd completed the volume. So, it covers six volumes. in the 1800s - 1818 he started - he didn't know that it was a shorthand. -from which the shorthand came. and some of the more tragic events in a turbulent period in history. as the Great Fire of London swept across the capital. that the fire was, in fact, getting very close to his own house. to try and protect his belongings. and his furniture off to be taken up the river. he came up with a rather interesting solution. which involved things you might expect, like important documents. this was a large piece of Parmesan, an Italian cheese. A man after my own heart, books and wine. and in his social standing. even rubbing shoulders with royalty. -..who was called Anthony Anthony. when it was given to Samuel Pepys by Charles II, as a gift. -it's called the Mary Rose. as the flagship to Henry VIII. -..from when it was actually sailing. that he was more than just a 17th century aficionado. -and it's one of the great books of the Royal Society. -And it has Samuel Pepys's name on the front. ..and the president had to give the licence to any book to be produced. he was an integral part of this time of social and intellectual change. -could nevertheless rise up in this new kind of world. -he would never have had the opportunity to get to know. of the Pepys Library remain his enduring legacy. but not for their car and it's time for all to say goodnight. a new lease of life for the classic car. and now suddenly I'm driving the car? -Shall I go and pick up those gears? You're OK to your left. -Keep rolling, keep rolling, go, go, go-o-o-o! -I was just about on your lap there! -Why were you sitting on my lap?! leaving him with £75 to play with today. Christina picked up a pair of pickle forks. A copper planter and stand. And a gramophone, totalling £130. So, she has £70 for the day ahead. And the competition seems to be hotting up - in the car at least! -Back in your box, Laidlaw. towards their first auction of the week in Market Harborough. And Gabor Cossa Antiques seems like the perfect place to start. David Theobald is overseeing the petite surroundings. -Hello, there. Is it David? -Yes, good morning. Nice to meet you. Oh, my word! If you hear a clatter, call the cavalry. I'm wedged, I feel like a pot-holer. It certainly is cosy back there. Mmm... Have you attributed your little...Cotswolds-esque...? -Well, I loved the way you said that, David. -Of course not. Let me see. Well, it does... It actually says, "To Dad." ..but was it new then? I don't know. It's not without charm. I'm not dismissing that. And I think it's priced right, thank you. Paul seems keen on the Arts and Crafts-style copper plaque. But there's plenty more to consider. Your caddy spoon there, who's that? I've not seen the long-stemmed one before. -No, no, but it's not silver, it's nickel. successfully used by the Keswick School of Art from around the 1930s. has long been a proponent of the Arts and Crafts movement. Look at the skill here. In profile - there's a great line, is there not? The planishing works the light. it gives it rigidity at a molecular structural level. Here endeth the science lesson. Smitten by science...and a spoon. So, you've got me with that, David. I love it to bits. And your price is absolutely fantastic. The £10 ticket price has really worked its charm on Paul. The speculative piece is the copper plaque. ..the two Arts and Crafty pieces? David. You are a joy to do business with. -I'm not going to be silly. -That's a great price and I'm going to shake your hand. A great price indeed. £25 and another two items bought. Let's leave Cambridge and our speedy shopper behind. Now, what's Christina up to? towards the village of Burwell in Cambridgeshire. that was once a vital part of life in Britain. with the help of local volunteer, Colin Marshall. -So, how long's the mill been here? -..and has been built on the site of an earlier mill. Under your feet here, there's the foundations of an earlier mill. helping to increase the population. was able to rotate depending on wind direction. of grinding grain has remained the same for thousands of years. -So, a handful of wheat, put it into there. So, round and round and round. I can quite see why they wanted to build a mill. Mills were at the heart of rural communities. for larger quantities of food and mechanised mills became a necessity. in England was exploding, reaching 16.6 million in 1850.
whenever the weather conditions were right. to ensure they could work around the clock. It was a relentless and dangerous occupation. Cos they would have been jolly heavy, wouldn't they? That's equivalent to 16st per bag! or breathing problems from the dusty environment. and competition amongst millers was fierce. There were four wind-powered mills in Burwell alone. I'm afraid there is more than a modicum of truth in that. in the wooden casings, called tuns. were satisfied with this little bit of extra. -So they'd gather more than they probably should have done? and went across to their own private sack buried in the wall. a dishonourable reputation, it was undoubtedly hard work. and they had to constantly adapt to the changing times. and the introduction of huge factories that spelt their decline. -Welcome to the best view of the Fens! -Just...I mean, you can really see, you can get an idea of how completely flat it is, can't you? Stephens Mill was owned by three local families throughout its history. It outlived the other local mills and continued operating until 1955.
that the mills made and the millers who brought them to life. the 25-mile journey from Cambridge to the beautiful Risby in Suffolk. one of which is housed in this spectacular 16th century barn. With the pressure off, it's time for a leisurely perusal for Paul. but is nipping into the other antique centre. so I'd better get cracking! Good Lord, can you imagine the house that came out of? I mean, that is a vast, isn't it? Not sure that even THAT would go in the back of my pick-up truck, though, would it? concentrate on something you could actually buy, love. I love that. That's lovely. Nice in oak as well. A really nice thing. £250, I really haven't got anywhere near that left, have I? No. You only have £70 left to spend, Christina. Let's see what Paul's up to. Things seem to have slowed down from amble to a complete stop. until I start thinking about Christina. Because she'll be feeling as happy as I am. She will have done well. Don't be so sure... Before she can do well, she has to finish shopping. And she's found something unusual outside. Where would you find another one of those? I mean, I personally, I can see an antique sign swinging from there. I just think it's rather lovely. How much has he got on it? Ooh, it's in the sale! Oh, it is a bit bent, isn't it? Well, I'll get it for a good price. It can't be bad, can it? I just quite like it! Where do you find another one? I've never seen another one before. I think I'll go and ask about that. Time to involve owner Joe Aldridge. Oh! It looks even more bent now from this angle! Ta-da! -That's part of the character! -Is it? Is that what it is? -OK. It's in the sale. And I'm assuming before it went in the sale it was £45. -What is it now that it's in the sale? Before it was in the sale, it was £80. It's been reduced to £45. -As a special treat, I'll do it for £40. Oh, no, come on, Joe! It's broken! But that's all part of the character! I'd rather give you £20. £20 and you have a deal. -Yay! Thank you, Joe. You're a star! -Do think I'll make any money on it? -Depends who's at the sale. Thanks to Joe's generosity, that's a reduction of £25 off the sale price. Let's remind ourselves of what they've bought. a copper planter and stand, a Shelley coffee service and a gramophone. She spent £150 on all five items. and the caddie spoon and copper plaque. but what do they think of each other's offerings? sort of copper and his little Keswick caddie spoons. because it will hopefully attract more buyers, so that's good. Holy moley! It's a hell of a lump of wrought iron metalwork. I don't know that I understand that purchase, to be honest with you. Oh, no, wait a minute, I do! It was £20! NOW I get it! I don't see anything, to be perfectly honest, in his selection of items, that is going to make a huge profit. -Of course it's going to be an interesting auction. It really is. And I cannot wait! after yet another incident, the pick-up has bitten the dust. And they've traded in for something with a bit more...style! Look at this, you've got gears, you've got brakes. I am slightly nervous, though, that we've actually just got into somebody else's car and driven off! No, this rather racy 1999 HMC MkIV is DEFINITELY yours. Just don't break it, eh! it's off to the first auction of the week in Market Harborough. -I am not cool with these things. No, I don't get excited. I get nervous. I can wrestle bears and wolves, so don't get me wrong! Well, we'll soon see if Paul's fears are warranted. As our duo pull up at the family-run film of Gildings Auctioneers. -Into the fray, Paul Laidlaw. -Oh, don't! Don't pile it on! Who has cast his expert eye over Christina and Paul's picks. you know, that's in good condition. They typically fare well at auction. for items in good condition there. in terms of its really Art Deco shape and style. but not what the real Deco enthusiasts are looking for. five lots at the auction today. -First up, Paul's lead soldiers. -£20 here, please. At £20. -Come on, you're into a ballpark! More bidders at £30 online. 30, for 32. Are there any further bids? You're out online. Both out. That's £7 profit on Paul's first lot. Let's see if Christina can fare any better with her pickle forks. And let's open the bidding, please. At £20? £10 bid. Thank you. £12 online. 12 online... At £12, inset bidder at 12. 15. At £15, at 15, thank you, £15 bid. £18 online. £18 Internet bid at 18. You're out in the room at £18. So, ignoring the auction costs, they scrape home with a £3 profit. This is going to be my nemesis. You're going to do well with this. That's a fantastic £35 profit, stretching Paul's lead. -I've got a little bit of a jog on. Oh, wait a minute, is that a cliff edge? Ever the optimist, Paul! Time for Christina's gramophone. -32, 35... £35 my bid absentee. At £35. At £35... £38 bid. Thank you. The absentees are lost, at £38 in the room. At £38, all done. giving Christina a £23 profit. The next lot is Paul's perfume bottle. Any bids at £30? Thank you. At £30, bid. At £30, I have bidders. -There's a maiden bid of £30. Cheap, though. Man alive! Oof! A profit is a profit, Paul. Next up is Christina's wrought iron bracket. -£10, then - let's start low at £10. As low as I go, at £10, can I see 10? I do. Thank you. -Somebody'll make a lot of money on this! At £18, any further bids? You're out online. I would round that up. 18, that's virtually 20. We might as well round up to £30! You've actually made profit on that. Aha, there's that optimism again, Paul. Or is it cheek? It's time for the auctioneer's pick. Paul's stoneware character jug of Nelson. £50 to start them. £50, at 50. Thank you. £50 bid, at 50. 65, online at 70. 80 they bid. -At 80, 85, still going. Are we all done? I'll sell. Paul has almost doubled his money there, with a £40 profit. Less brackets, more jugs! Less brackets, more jugs! -Now it's over to Christina's Shelley coffee service. -£30 I bid. £30 here. £30, at 32, 35, 38 now bid in the room. And I'm out at 38. Any other bids? I'll sell at £38. Don't worry, Christina. You still have another lot to go. Is that angels singing or is that just on the inside?! You seem to have lost your nerves, Paul. Well, here comes the roulette wheel. Thank you. £20 bid at 20. At £20, is there any further bid? -It's going to sell for 20 quid! No way! £5 down but still out in front. and it comes down to the copper planter and stand. -There are bids coming in here at £40. 40, I bid. 45, 48, 50... My bid at 50, the absentee is at 50, at £50. although it's a loss after auction costs, I'm afraid. Christina set off with £200, enough to pay auction costs. She has lost £17.16, leaving her with £180.84 for next time. and giving him the lead after the first leg. So, what just happened? Wait a minute. Where am I? You're positively glowing! Positively glowing! -Will you behave yourself! There's nothing in it. -You love that, don't you? -I love it! It's just beautiful! Go on, let me! Let me! Please! Go on, you're the winner. I'll chauffeur you. Go on! -I am happy to be chauffeured. You go ahead. ENGINE REVS This is the kind of car that needs sunglasses. Whoo! Oh, my God! I love it. Don't you just love this stuff? ..while Christina just gets all hot and bothered. Ooh, I'm a bit hot! Antique experts Christina Trevanion and Paul Laidlaw kick off a new trip in Suffolk and Cambridgeshire. Armed with £200 each and an ailing pick-up, they shop up a storm before heading to an auction in Market Harborough.